You can't, because like lots of young types you've had it explained to you in a cack handed manner. Now, if it helps you sleep at night, go on believing what you describe, it means not a lot to me except when you try to suggest for jocular effect that somehow you are right and I'm not. I had considering creating an artificial scale model to show you actually what does happen, but you know, I can't be asked sll I'll add just as a parting shot. 1) What do you witness in a zero tide environment when the fleet is lifted by a favorable windshift to your (starboard) end of the line just after the start and somebody was slightly ahead of you off the Port end, how is your relationship to that Port ender looking now? 2)Now, same scenario the Port ender gets away that couple of seconds ahead of you but you are heading into that cross tide that is going to lift you on starboard. How is your relationship to the other boat? I'll answer it for you, unchanged. So, my point is that a tidal lift without differentation does not have the same effect as a windshift, so using diagrams showing vector variations is misleading. My diagram wasn't showing a change in wind direction over time, like a lift which happens just after the start. It was showing a permanent shift in breeze from the true wind direction. Neither of the boats changed their position relative to one another, it's just that the boat at the starboard end was upwind. Ahead and always ahead. If it was explained to be me in squad sailing I can't remember it. Nothing in this thread is a squad mantra. I learnt about it from these series of articles by Roger Palmer and Keith Walker. I think I had always known it subconsciously as you can just feel the lift or knock when you cross the tide line in your actual bearing, ignoring looking at fixed points on land or buoys. Other effects are more subtle. Current creates a ‘current wind’ as it moves boats through the air; this will change the sailing wind of each boat. 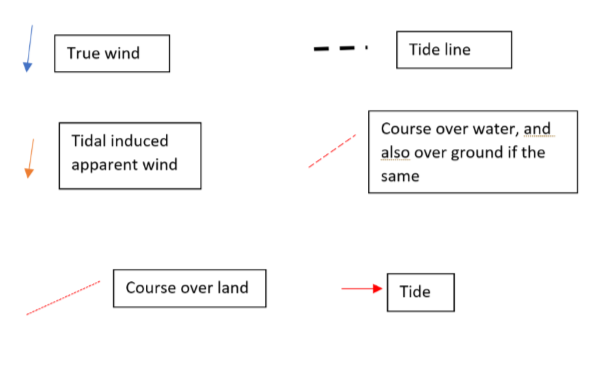 For example, a current from the leeside will free and increase the sailing wind (this was discussed in last year’s article); the reverse applies with weather bow current. I've won Chichester Race Week (Fed) four times now, but I'm not ashamed to say if Roger or Keith (or the Lyton's, or Sayce's or Williamson's do) start in a fleet before, I'll copy them, then worry about figuring out why it worked later. When there is a right shift it favours the boat with leverage on the right; assuming they can cross the other boats before the wind shifts back. When they hit the right going tide, both boats will feel a lift on starbaord, this will be a gain to the boat with leverage out right; see my post below. There is what I've called tidal 'drift' for want of a better word. All boats being swept across the course are so equally. But there is shift that occurs due to the tide caused by the boats being moved with the tide. This creates a gain feature. It why you likely got ahead in that windsurf race. Using diagrams and vectors is not 'misleading'. It is the opposite and quantifies the effect I am describing without using ambiguous language. So, here’s one last try. I’m going to break it down in to bits, to separate the different tidal effects to show exactly where a gain would occur, and how you can use it in strategy. Below is a scenario where two boats start from the exact same position, but one goes left, and one right up a beat. They then cross a tide line and tack back to the centre to see who made a gain. There is no current at the bottom, they then cross a tide line in to left to right tide. So, first of all we have what I shall call here ‘tidal drift’. Both boats hit the tide at the same time and tack back toward the centre of the course. Both boats are swept right by the tide, skewing the beat so that they spend less time on port (if the mark isn't offset), and they sail a lifted course but slower speed over land on starboard, and headed course at faster speed over land on port. 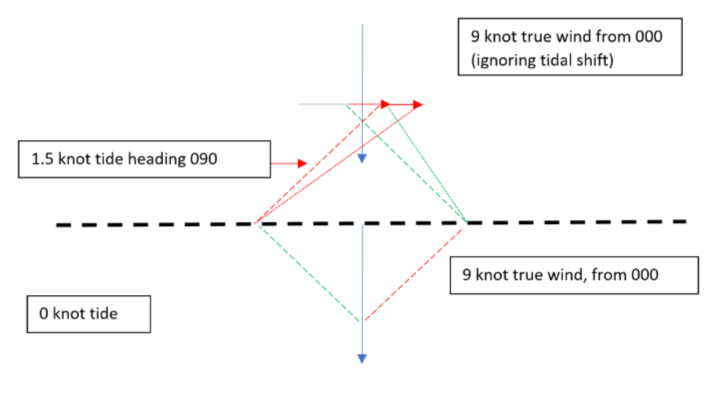 As the tidal vector is left to right, it doesn’t affect the progress they make upwind and their positions relative to one another stay the same; they both just get shifted equally to the right. As you can see from the grey gain line, both boats are still equal when you account for 'tidal drift'. I believe this is what you are saying iGRF? That the tide will sweep boats across the course. Their course (relative to the land) will appear lifted on starboard, but neither will make a gain relative to one another. If there is anything tactical to take from from this it is that you may be swept across to the starboard lay line quicker than you anticipated. But there aren't any gains you can make from creating leverage on other boats. Now, what I was describing with my earlier vector diagram was a 'tidal wind shift'. But I used it in relation to bias on a start line. As described in the video I posted it can also be felt as a shift as tide changes up a beat. By being the correct side of this shift you can gain actual positions, just like being on the inside of a shift in the true wind. The boat that goes right in this situation is on the inside of the shift and makes gains. The result is a tidal wind shift lifts the boats course over water; from which real gains can be made. 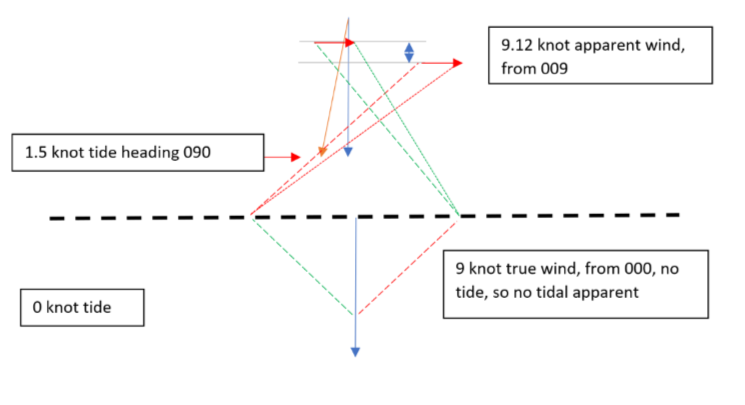 The shift, as I explained in previous posts is caused by the tide moving boats across the true wind, creating an apparent which is more from the right compared to the bottom of the beat (see vector posts). The diagram below only shows what will happen to the boats because of the tidal shift. Now, you can add the tidal 'drift' to the tidal 'shift' by adding on the tidal vector for the top of the course. But, as demonstrated in the first image, tidal drift just moves the boats across the course to the right. You can see that boats now end up further right on the course, but still the only gain is made from the shift in apparent. So you can see, knowing that the tide will move you across a course is fine (top image), and you can bear that in mind when calling laylines or staying in the centre of a beat; but it's not a 'gain feature'. The knowledge that tide can increase or decrease apparent wind seems obvious (everyone knows wind against tide makes the wind stronger, don't they?). 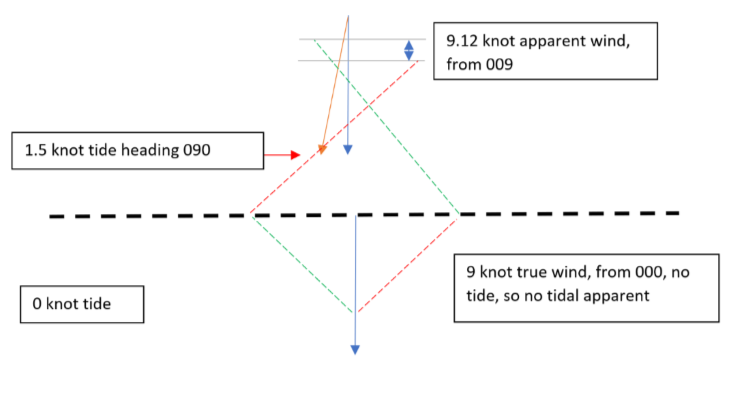 But also knowing that the tide can shift the apparent wind direction is most important for a racing sailor, as this shift you can leverage for actual positional gain (second image). You can sum this up as "get the strongest tide on your lee bow". Which is then miss interpreted by people who think this rule of thumb means to point higher to get the 'bow up' over the tide. What it really means is to tack on the apparent wind shifts created by changes in current. It why you likely got ahead in that windsurf race. Dude have you any idea how patronising you come across? I'm not posting victories to prove my credentials, i don't have enough! I'm saying regardless of any success I've had I don't feel at all above learning from others. Anyone who can put forward a sound argument I will listen to and try to learn from. After 19 pages of discussion you've yet to post anything which backs up what you're saying. All I'll say is I love racing against sailors in tide who believe all that guff they're fed about there being no such advantage. As much as I enjoy joshing with you boys, I would dearly love to show you the facts of racing in tide. Dinghy sailors told me all the codswallop thirty five years ago, they are as wrong now as they were then. Try to think of it like that, tell your therapist you have advanced dinghy tidal retard syndrome..
Will you feel better knowing as usual you're all wrong? You then start a quiz thread, with yourself as self elected 'quiz master'. lol, it's one thing regurgitating something you've read in a text book, quite something else when someone calls you on it.. I'm sorry but whoever told you all that doesn't entirely understand what is going on, where the Energy is coming from. it's irrelevant to you and you'd never have experienced it. when you understand that, you'll be fine. I can't help anyone who doesn't get that. like lots of young types you've had it explained to you in a cack handed manner. I've tried to answer everything in as open and non patronising way as possible. Sorry if you feel offended, but you did start a thread on the internet declaring yourself 'quiz master'.